My regular checkbook is hard to read by the end of the month. Transferring the information to this easy to read checkbook helps me ensure the balance is accurate. At the end of the tax year, I can easily find tax deductible transactions! I write very few checks, but pay most of my bills on line. This gives me plenty of room to write their "confirmation" number after the description. I really like them! The best use for a check register is to register your checks. I know no other uses. The large print check register is very helpful to the senior citizen with visual impairment. At the same time he can maintain independence for financial record keeping and check writing. The individual can see the number of the check, the amount, and the date without a struggle. THIS IS A WONDERFUL PRODUCT> Thank you. Since I have started using this item I have not gone back to the small registers the bank gives you along with the checks. Cover could be a bit thicker, but all in all these are the best registers I have ever used. These are very easy to see with plenty of space to write. Great if your vision isn't too good, or even if it is! This check register is perfect for my aging eyes to see. I really like the size, it fits perfectly in my desk. IT IS PERFECT FOR ME MY HANDS ARE A LITTLE SHAKEY, I CAN READ MY WRITTING, I AM GOING TO ORDER ANOTHER ONE. I bought this giant check register for my elderly mother who still wants to keep her own checkbook but has difficulty writing in the small spaces. The giant register allows her all the room she needs for entries, but also enough room for mistakes and corrections. She is delighted with this. Love this, was always forgetting to write my spending down until I got this register it's so big that as soon as I walk in the house and see it I go straight over and write down every thing I spent that day. I really love how big it is I can write the name of place I went to and what I got or why on the same line that helps when I have to get stuff for my taxes ready.I like it so well that I'm getting more for me and one for my parents and mother in law.one other thing I really like is the more you buy the cheaper it is best time to stalk up. I am a repeat buyer of these and will purchase again in the future. It is a wonderful product! I would purchase this again and again. Great tool for keeping tracks of payments made by check. More space for notes and other verification information. Large enough to stand alone so its also a safety factor as well as convient. Spiral binding could be flatter maybe instead of circular in shape. My wrist runs into it as I write checks before the mid-section. Otherwise, very fine! I had bought this product before and will again! As a retiree, I pay my bills twice a month. 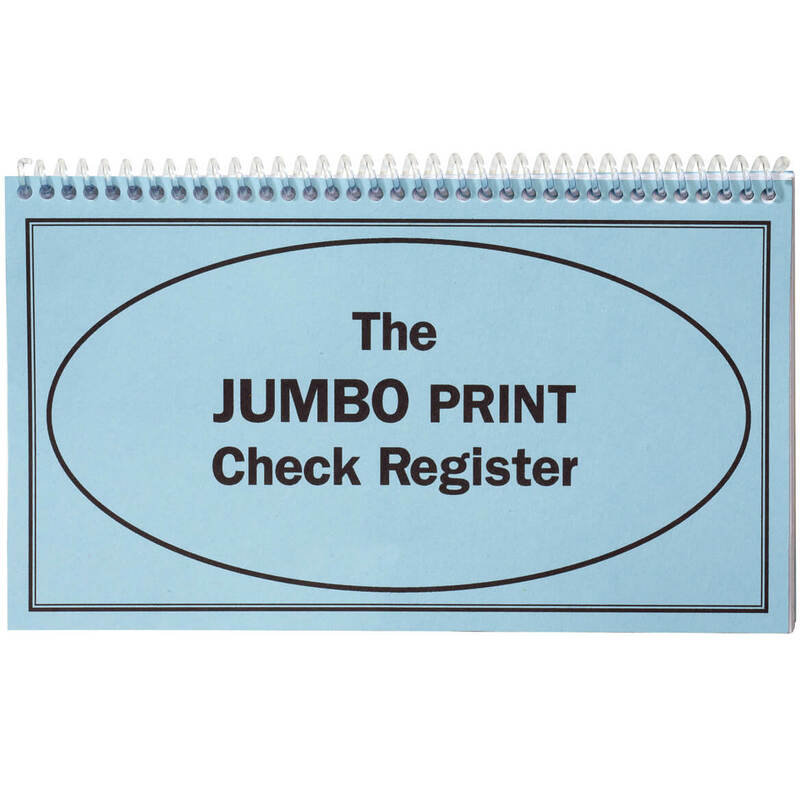 Using the check register helps me tremendously in keeping my account balanced, especially with the large print. My first one lasted from January, 2015 until October, 2016. I immediately got a replacement and will continue to do so. Very handy indeed! I always buy this product. Love this big check register. They are larger and I can add more info. Very easy to see and I can keep my tax deductible slips in it. Love these. Lots and Lots of room to write. I can finally see to reconcile my checking account. A little flimsy, but has plenty of pages & good print quality. Will buy again. great for all occassions, very compact, but all you need in a stylish purse. This was a gift for my sisters with poor eyesight. They really liked them. I BOUGHT TWO OF THESE BECAUSE I WASN'T SURE HOW BIG THEY WERE. I'VE BEEN MAKING MY OWN BUDGET BOOKS FOR YEARS. I WISH I HAD FOUND THESE SOONER. THERE ARE 14 SPACES ON EACH OPEN PAGE TO LIST PAYMENTS AND THE SPACES ARE SO BIG YOU COULD LIST TWO PMTS. AND EACH BOOK WILL COVER MORE THAN TWELVE MONTHS. THEY ARE PERFECT. Helps me keep my bills in order wonderful ?????? my vision is changing so i purchased this to prevent me from strainging my eyes. This product is perfect for anyone who has limited vision! Would always purchase this product! I have had a stroke which had changed my life style alot. This check book fits into the new way i need to do things. Large print is great for old eyes. I bought 4 of these for my 94-year-old mother-in-law whose vision is not as good as it used to be. The bigger spaces and print help her a lot. Something I had been looking for. I had been looking for this item for a very long time. I am not the best at writing and did need the extra room. This is just what I needed, because I write big! I have been looking for one , and found one in you book! I order from you often and am always pleased with my purchase. I coordinate our family reunions. It is easy to maintain payments that are made, if balance is close enough for the trip. Sometimes I am asked to hold monies for them, easy to keep track of what they have spent and whats left to spend. I like the large print, it makes my Banking so much easier because I can see the register as those compared to the Bank registers. It could be constructed better, and more pages for my buck, I believe the register was more sturdy and also more pages for my money, I would forever use this register. It's a wonderful way to keep track. The new registers that I purchased at Walter Drake are perfect. You can add a memo under the name and see what you wrote without looking any other place to remember what you had done last time. 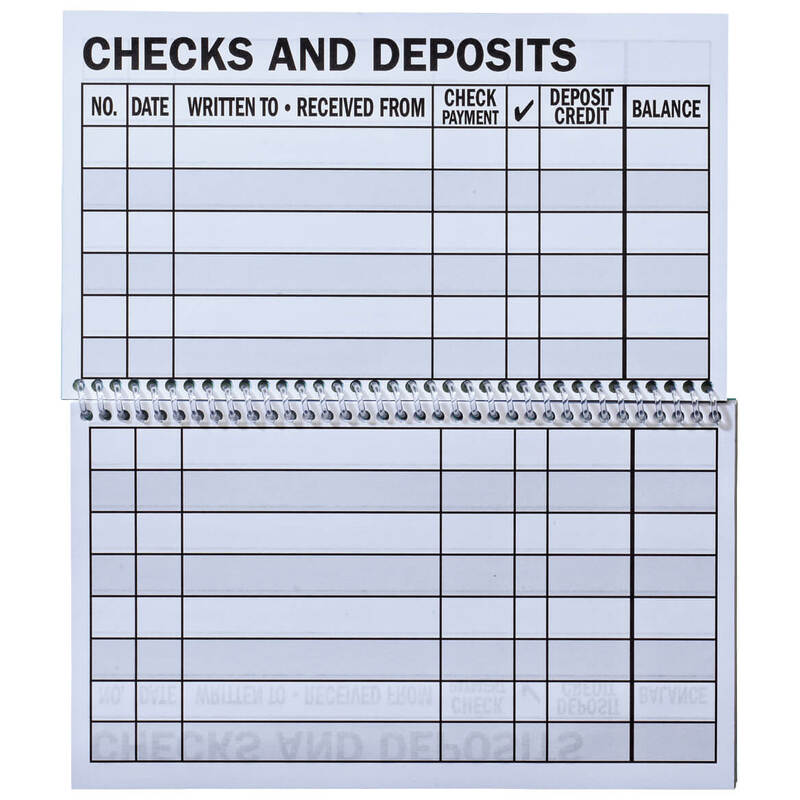 This checkbook register makes baancing my checkbook much easier! As I have aged, my vision is not as good as it once was and this register makes balancing much easier. 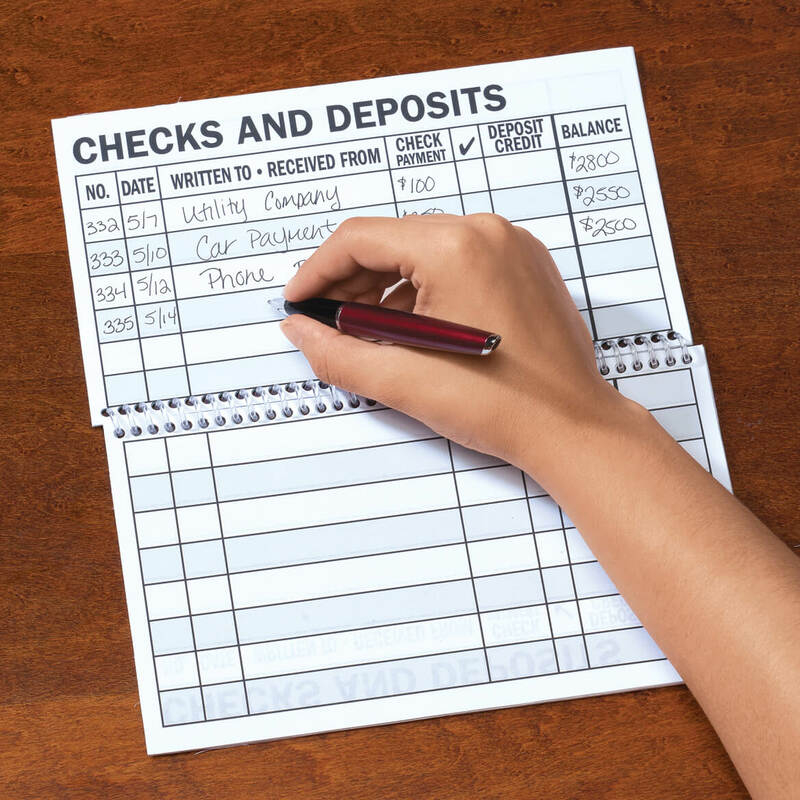 These check registers are so much easier to see when keeping track of your checks. I buy several at one time and then when my supply gets low, I order another supply. Have only used these large registers for years. Bought for my sight impaired father. Helps him maintain his independence. I told you all above except I am not able to write the amount at the moment I write the check as the register is too large to carry in my purse. Must do that when I get home. it up. Yep i can see this one no problems. I got this for my Grandmother to help her see better . She LOVES it . Products for folks who have low vision are hard to find. This item fills a need long over-looked. Thank you. Needed one, and these were perfect. I saw it and said this would be great on my eyes. Used up my other ones and this one looks like it would be easy to use. My sister has a tremor and can't use a conventional check register. My husband needs a check register for his checks and I thought the Jumbo size would be nice for him for his vision. I have one they are great need to get one more..
To see if I like better than regular check registers. As I age my eyesight is getting worse and it is getting harder for me to see the transactions in a smaller check register. I thought the large print would make it easier. Person buying it for has Macular Degeneration and needs a larger check register. I picked this item for my daughter with Down Syndrome. Because it is larger it will be easier for her. This was chooshen for my sister-inlaw,who has failing eyesight. For my 90 yr old mom, to make her banking easier. Larger print helps when it time to do taxes. Constantly running out of space and pages. Spiral is great! Much more convenient than registers that come with checks. To write my online account in it. My grandma loves it because it's easy to see. I got one before and it is almost full. I have not seen this item anywhere other than your catalog. My hands are getting hard to use so the larger lines should make it easier to balance. Have used them for about 2 years. Much more room for more details on purchases, online buys, etc. Handy thing to have and good on the eyes. I like the size of it. I think it is neat. Going to give to my husband to help him keep track his check writing. My regular check registers are very small...decided to try these. I need these booklets to keep banking records. The measurement 9x5" closed or open?? BEST ANSWER: Thank you for your question. That is the measurement for the item when it is closed. We hope this information will be of help to you.